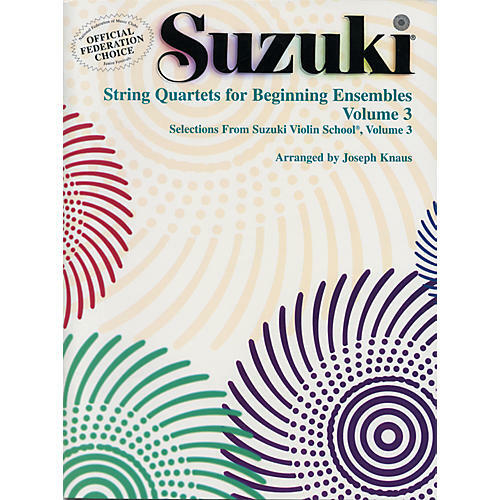 Comprised of works from volumes 1,2 and 3 of the Suzuki Violin School, which have been arranged for string quartet by violinist/arranger Joseph Knaus, these collections are the first publications in the new series, Chamber Music for Young Musicians. With lower string parts providing melodic and rhythmic counterpoint to set off the simple melodies (which match the Suzuki Method repertoire), these quartets are nevertheless simple enough for beginning level players ready for their first chamber music experience. These publications are sold in sets including full score and one part book per instrument.